Elite Guard cadet Strongarm isn't one for subtlety. To her, everything basically breaks down to a binary, Right vs Wrong, no distinctions. Naturally, this makes her difficult to work with at times, especially considering her teammates include a hot-shot punk who breaks rules almost habitually and a convicted criminal, but she's dedicated to doing her job of recapturing the escaped prisoners on Earth to the best of her ability, so she's learning to suffer those two. When Hasbro releases the first trailer for the new cartoon, Transformer Robot in Disguise, a certain character had my attention. Strongarm, since the show isn't even started yet, it's hard to talk about her, but from all the short clip that Hasbro put up on YouTube, she seems like a fun character to learn about and I look forward to it. 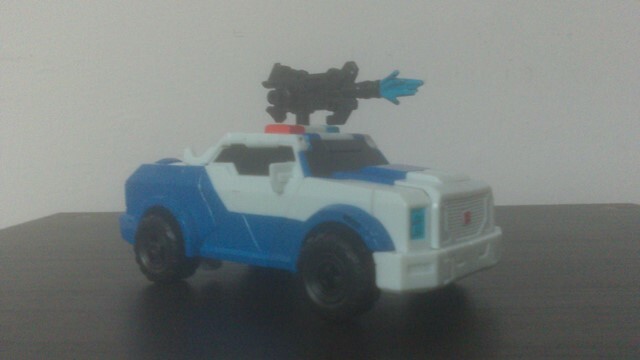 Strongarm's alternate mode is a jeep with a theme in law enforcement, I question the reliability of a jeep to chase the bad guy, but she is a Cybertronian so real world limitation might not apply to her. In jeep mode she is mainly light blue and white with some black for windshield and a few lighter blue and red here and there. It isn't much. Base on all the short clip I saw, the ALT mode design is pretty accurate to the show, it's just very lacking in color. In the short clip, she has a darker blue that is missing the toy. And the painted light blue isn't 100% matching to the blue plastic, you probably won't notice it unless you take a closer look. However, that's not the only problem it has, the ALT mode also is pretty gappy, not sure if gappy is a real word, but that is the only word I can think of to describe the problem. Because of the way she transforms, she has a lot of panels that fold around and sometimes those parts doesn't fold and connect properly with each other, creating a gap in between. And the rounded edges don't help. But it's not all bad as in the right places (for example the front of the jeep), those gaps will create an artificial panel line that adds to the design giving it more details. In ALT mode she has two places that you can attach the only weapon that she comes with, on top of the siren or hidden under the vehicle. 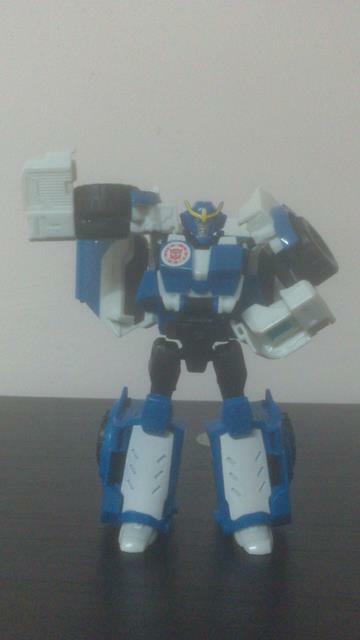 I like transformer that allow me to hide the weapon in ALT mode, I wish there were more transformer that does that. Overall, the ALT mode is pretty good looking and show accurate, even with all the aesthetic problem. If you have looked under the jeep when I talk about weapon storage earlier, then you know that Strongarm is a shell-former and because of that, her transformation is really simple. Do it once and you shouldn't need the instruction anymore unless you are a young child. 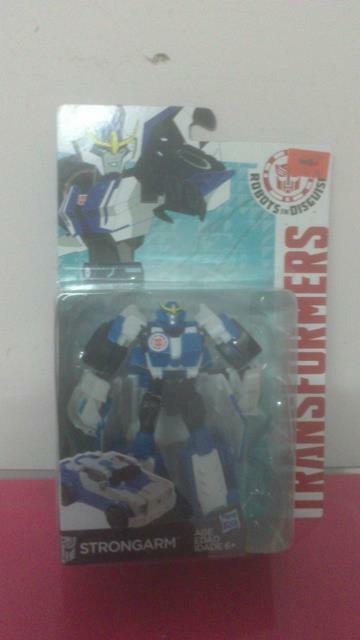 In robot mode, she is is mainly light blue with white and black highlight. Very simple and sometimes simple works. But because she is a shell-former, she is cursed with kibble heavy and those kibble will bang into each other a lot, but don't let that get you down because those kibble actually adds to her overall design (with exception to the hands), it makes her look chunky and amazon-ish, accurate to how she would look in the new show. O.K, she is more streamlined in the show, but still chunky. Her head is pretty accurate to the show down to the big lips, although unlike the show, she got a light blue helmet instead of white with light and dark blue highlight. The horn on the helmet is painted yellow, her face is painted silver, nicely painted blue eyes but no lipstick. I personally prefer light piping instead of painted eyes. But I still like the paint job on her head. She got a pair of really huge shoulder and it would bang on the backpack, so it might limit some articulation. Her bicep is a pair of wheels, not quite accurate as the wheels are supposed to be her shoulder. Her hand is surrounded by kibble preventing her hand from viewing in any direction other than the top. This is the only places where the kibble causes some aesthetic issue. Her body design is pretty accurate to the show, but slightly more bulky. Thanks to the new gimmick with the mobile game, she got a pretty big autobot badges on the chest, but it’s not out of place or odd looking. The overall design is still accurate to the show. Her legs, like the show, have a pretty big feet, well big feet just mean more stability. Her backpack is huge because it’s consist of the top of the jeep and a pair of doors, but it’s not that big of a deal, a lot of people have the door folded all the way back, that would make her backpack really huge. But that is not how she looks in the show. In the show she got a pair of door as a pair of wings, so you are supposed to keep the door to the side. If you keep the door to the side, the backpack while is still pretty big, but not as big as you keep the door folded. Now for articulation, her head is on a ball joint, so she could look in every direction, including up, but not much down. Her hand can swing back and fore up to 360 degrees depend on how you fold the backpack, swing outward for a 90 degrees. Elbow bends close to 180 degrees thanks to the transformation joint which give her a double elbow joint and a rotation, however, bending all the way up would look like she is transforming to her ALT mode thanks to the kibble on the hands. Nothing at the wrist, because of the transformation, hip can rotate a full 360 degrees. Her legs can swing forward for a 90 degrees, backward for up to 90 as well (depend on how you position the legs against the backpack), outward for a 90 degree (a full split), rotation at the thigh, bend for a 90 degrees at the knee. Because of transformation, ankle can bend backward as far as you like. For such a chunky figure, she has a surprising number of articulations and no problem utilizing them. For weapon, she only comes with a single handgun that is pretty big for a handgun and it looks just right when held by Strongarm. The handgun can also be attached to her backpack for storage. However, oddly, they decide to add some muzzle effect on the gun so it looks like shot have been fired. 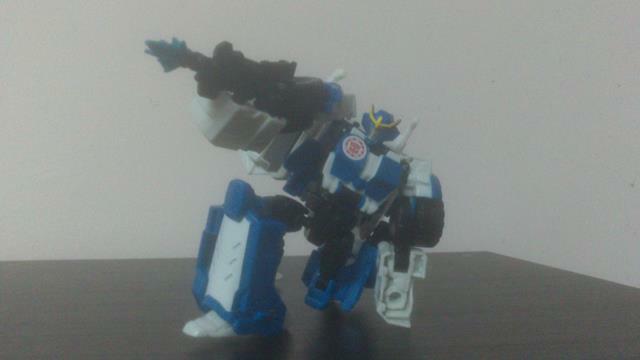 This would limit the posing capability of the gun to shooting pose, which is a downer. They should have made the muzzle effect removable. Overall, as chunky as she is, she is still a pretty good looking figure. Not 100% accurate to the show, but all the general idea is there, she is bulky and heroic. She might be kibble heavy, but doesn't limit her posing capability, she might actually more flexible than some of more streamlined fembot that I own. Durability: 8, nothing fall apart, pretty solid. Fun: 7, her vehicle mode is not much than any other toy car. Her robot mode has more replay value. Aesthetics: 7, pretty accurate to the show in both robot and jeep mode. Value/Price: 5, TRiD line is still new, so it should be quite cheap. Overall: 8, Strongarm is a pretty good figure overall, yes, she is chunky, yes, her transformation is simple and boring, but she has a lot to offer like posing capability, good looking in both robot and ALT mode, all I can say is, if chunky fembot isn't your thing or you would like something with more complicated transformation, than Strongarm isn't for you. But if you want a good representation of the character that is currently available, then pick up this figure.